In 2006 Universal released the first Deluxe edition Abba album, with "Arrival". Now 8 years on they've reached "Waterloo". 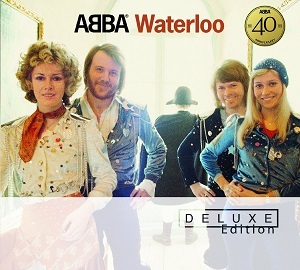 It's Abba's 40th anniverary year, and it see's "Waterloo" getting the Deluxe edition treatment. As with all the deluxe editions, you get the original album plus lots of bonus material. Alongside the original album there are 8 bonus tracks, plus a DVD of rare and previously unreleased television material. The package also includes a 20 page booklet featuring lots of information on the making of the album, along with brand new insights from Björn and Benny. "Waterloo" was ABBA's first album and was released in 1974. Despite the single "Waterloo" reaching number 1 and spending 9 weeks in the UK charts, the album didn't do so well, peaking at number 28, whereas from "Arrival" onwards, the band's albums over the next few years all topped the album charts. As well as the title track, the album includes other well known ABBA songs including "Hasta manana", "Dance (while the music still goes on" and "Honey honey". The bonus material on the CD is different versions of songs from the album - either remixed versions or versions sung in foreign languages including French, German, Spanish and Swedish. The DVD features the band's performances in the Eurovision song contest and Melodifestivalen as well as other TV appearances. As with the rest of the albums in the Deluxe edition series this is a great release with plenty of bonus material that makes it a very attractive purchase.